There are many great joys in vegetable gardening, too many to list, and only one that is the focus of this little essay: the opportunity to try growing vegetables that are hard to find elsewhere. Early each year, when the paperback tome of the Seed Savers' Yearbook arrives, I take it to bed with me and spend hours I should spend sleeping poring over the descriptions. That is something I love about it—no pictures, simply descriptions, and if I'm lucky, a fascinating backstory. My imagination works overtime as I read the Yearbook. I imagine what each variety will look like and taste like, and how or if it will fare in my mild wintered, alkaline soiled, droughty clime. Many I can pass up right away, others I hem and haw over, while others call to me so powerfully, I have to give them a chance here. One such vegetable had its first chance in my garden this winter, a test it passed with flying colors. 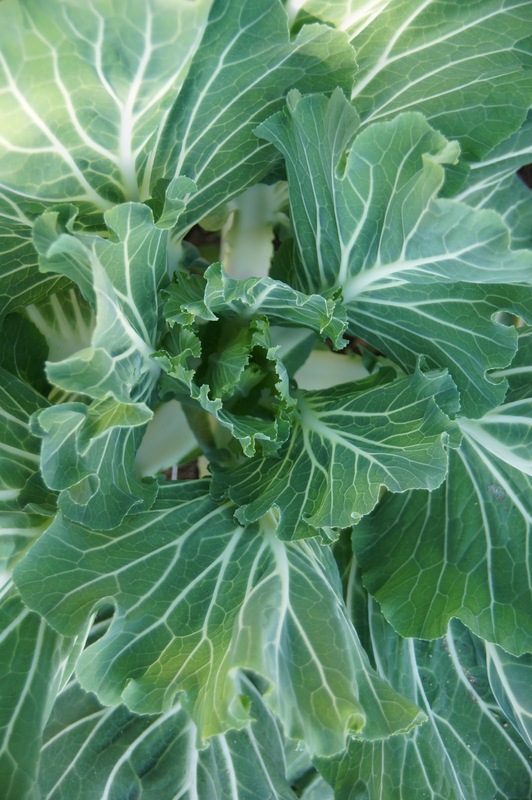 This brassica goes by many names, Portuguese Kale, Portuguese Cabbage, and Couve Tronchuda. It grows like collards, tastes like sweet cabbage, and looks like giant, soft-green, white-veined roses in the garden. I started it in six packs this August with the rest of my brassicas and it grew floppy and spindly until October, when it hit the real dirt in my garden; there, it thrived. Though I picked a few cabbage moth caterpillars off of each head through the winter and once had to rinse gray aphids off, for the most part, it has been an easy grower and a beautiful addition to a winter vegetable garden. Beauty is only part of the story though. Couve Tronchuda is tasty, tasty, tasty. Some of the seedlings I gave away this autumn have ended up in cabbage rolls and slaws. Apparently, this cabbage is the green frequently used in the famous (and delicious) Portuguese Caldo Verde. In our house, we've only eaten it one way so far, but it is so good, it has been the only way I've wanted to eat it. I've cut the wide, petal-like leaves cross-wise into ribbons and sauteed them on high heat in olive oil until the greens are wilted with a few charred spots, but the stems are still sweet and crunchy. Then, I give the whole pan of greens a shake of sea salt and pile it on plates with a drizzle of hot, savory, complex (and did I mention hot?) Angolan hot sauce. Do not remove the seeds from the chiles, but put the chiles whole (minus the stems) in a medium saucepan with all the remaining ingredients. Bring the mixture to a boil, then partially cover the saucepan and reduce the heat to low. Let the mixture simmer for an hour or so, until all the ingredients are cooked well enough to be soft. Remove from heat and let the mixture cool enough to handle it safely. Pour the contents of the saucepan into a food processor and whirl until it is very, very smooth. Aim to grind the seeds to oblivion as well. Pour the paste into very clean class jars. 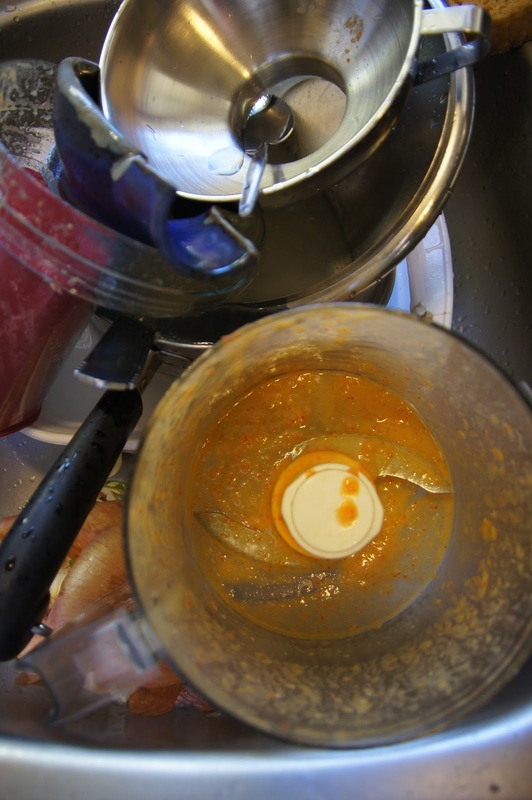 Leite writes that the mixture lasts up to two months in the refrigerator. Since I poured mine into small jars, I'll leave one in the refrigerator to use and place the rest in the freezer. My numbers are 1590, 1586, 2042, and 2061. These are the spaces I bought for Covina High's Cow Chip Bingo fundraiser. I hope a cow poops in one of my squares. There are potentially $1000 to win in that pile of crap. Covina High, not the school at which I teach, is one of the three high schools in my district. It is the only one to have a FFA (Future Farmers of America) program; in fact, it is the only school for miles to have one. 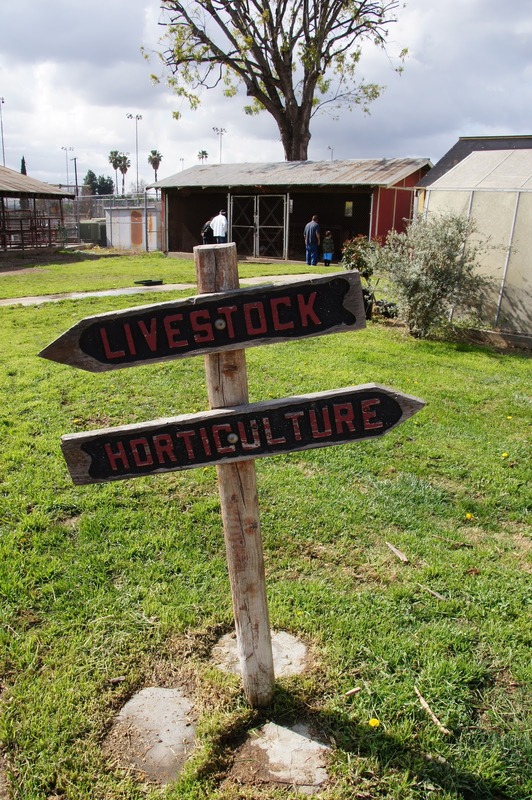 Nowadays, there are less than ten FFA programs left in Los Angeles County. 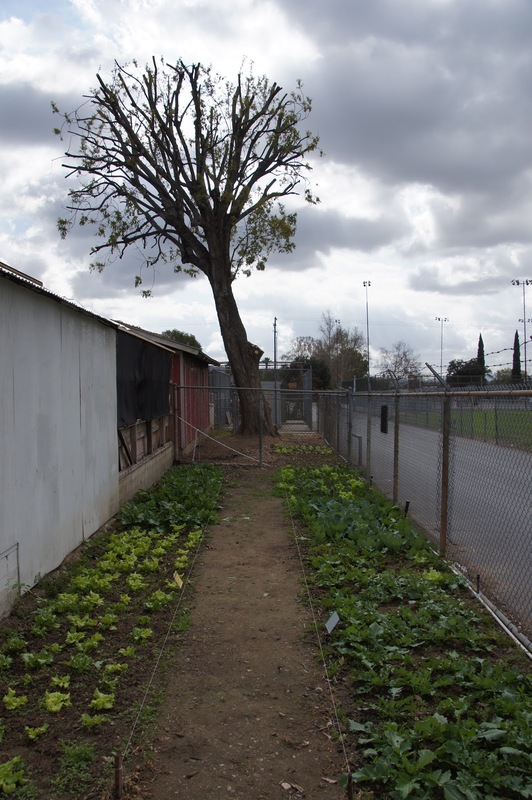 In the fifteen years that I've worked in my district, until recently, every time I was on the Covina High campus, the agricultural area appeared deserted and unused. That has all changed in the past few years with a new teacher, a young woman who has inspired her students and her community. Now, district members can stop by The Farm every Thursday afternoon to buy eggs. 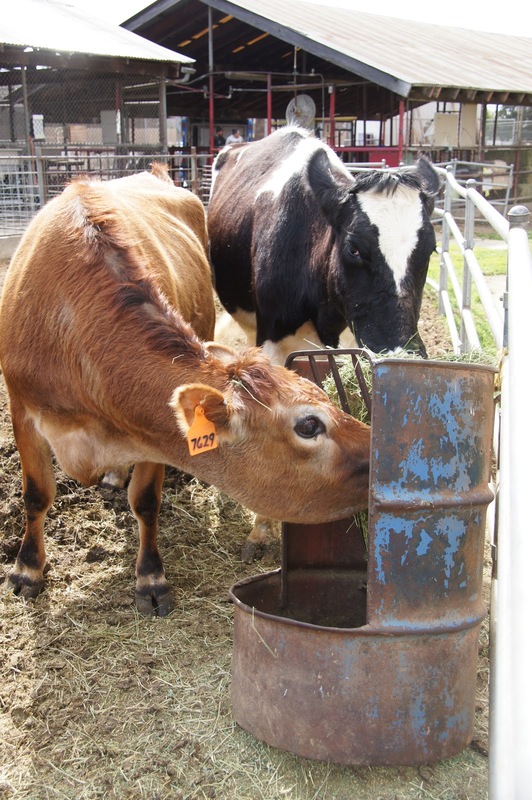 There are more meat animals than ever, and the partnership with the California Dairy Council has grown. 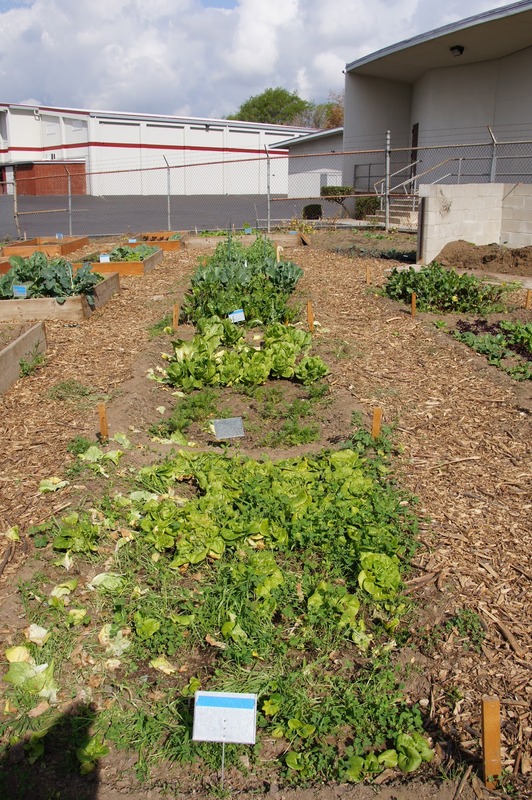 The students grow all kinds of vegetables and have planted a small citrus orchard. Today, Covina High FFA is holding a fundraising fair, and I headed over this morning to check out the happenings and to buy some flower seedlings. It makes me feel good that in the middle of suburbia, I can find the smell of cow manure and the sound of happy chickens. The fact that local kids are learning that the hamburgers they eat and the milk they drink come from actual animals with personalities and pettable noses thrills me. And, these kids are growing their own vegetables! And they eat them! Even the turnips! By the quantity of exclamation points, you can probably tell I am in love with this farm, so in love I've made an effort to support it. Last year, E and I bought a whole lamb and a portion of a pig to share with friends. High school students raised the animals, cared for them well (so well, they were pet every day and named "people names": our lamb was named Dillon), fed them organic feed, fresh water, and lots of attention, and ushered them through a pleasant, healthy life before they graced our dinner table. I met Dillon the lamb before he went to butcher last year. He let me scratch his head. He was also the best lamb I have ever tasted, succulent and rich. This year, I've put my name in for another lamb and a whole pig. The pigs and lambs haven't arrived at the farm yet; they'll get there in March to go to slaughter in the late summer. I've talked to kids who've raised meat animals in the program. They tell me that it has changed their attitudes towards meat, and that now they choose to eat more parts of meat than they had before, that when they sit down to eat dinner with their families, they remember the animal they are eating. And, if we're going to eat animals, isn't this the way it should be? Eating the whole animal, not just the one part we think we like? Remembering that it is a life and should be valued as one? Remembering how much work went into raising an animal, and that being able to eat one is a real luxury? This relationship with our meat is healthy, and, unfortunately, far too unusual. Today, I talked to a kid who'd graduated from Covina High and the FFA program two years ago. He got excited when he heard I was a member of Seed Savers Exchange. There aren't many 20-year-olds who get excited by such news. But more importantly was the news he shared with me: he's in college now studying to become an agriculture teacher so that he can work in another program like this one. Addendum: I just picked up my mail, and in it, I received my first seed request of the year from the Seed Savers' Exchange Yearbook. It was from Medomak Valley High School's Heirloom Seed Program requesting my Monticello Poppy seeds and more information about their historic background. Happy is far too mild a word.